Pound traders may have more reasons to fret next week amid economic reports that will show the true extent of the fallout from the U.K.’s decision to exit the European Union. Sterling, already this year’s worst performing major currency, could come under further strain as reports on inflation, retail sales and unemployment benefit claims provide more detail on how the U.K. economy is faring after the referendum. The pound has been one of the most obvious causalities of Brexit, undergoing its worst-ever day when the result became clear, while losses deepened in the last week in the wake of the Bank of England’s decision to cut interest rates and boost its stimulus plan. Sterling has dropped more than 13 percent since Britons opted to leave the EU, and fell below $1.30 this week for the first time since July, approaching the three-decade low of $1.2798 reached in the wake of the vote. It has already surpassed its post-Brexit low against the euro, sliding to its lowest since August 2013 on Friday. While surveys since June 23 have shown contractions in construction, manufacturing and services, next week’s figures will provide more concrete evidence of the vote’s impact on the economy. The data is forecast by economists to show jobless claims increased in July, while retail sales barely grew. The pound slid 1.2 percent this week to $1.2920 as of 5.55 p.m. London time on Friday, after touching $1.2909, the lowest since July 11. It slid 1.9 percent to 86.44 pence per euro, after touching 86.53 pence. The latest move lower in the pound has been driven by the Bank of England, which last week cut interest rates to a record-low and restarted its quantitative easing plan. 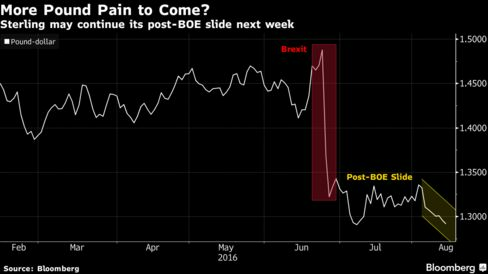 The BOE’s buying got off to a rocky start this week as an operation Tuesday saw it fail to receive enough offers for longer-term bonds. The purchases will resume on Monday, with the following day’s buying of debt due in more than fifteen years likely to be closely watched for more signs of scarcity.